Large pieces of the massive glacier that broke off northern Greenland last year are travelling near southern Labrador. People following the ice island’s progress said Thursday that Battle Harbour, an island off southern Labrador, may soon be the best place to see large pieces of it. "The 62-square kilometre one which we affectionately call P2A is actually going back closer to the coast of Labrador again," said Charles Randell, president and CEO of C-Core, an engineering research and development corporation at Memorial University of Newfoundland. "If it continues to come due south it would be right at Battle Harbour by Thursday or Friday [July 1]." Gordon Slade, the head of the Battle Harbour Historic Trust hopes the organization can capitalize on the windfall. Slade told CBC News the ferry running from Mary's Harbour to Battle Harbour can be used for iceberg watching. 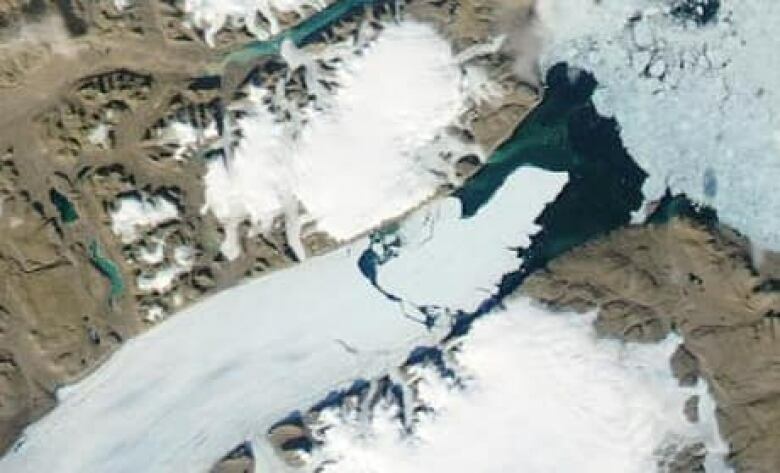 A massive ice island, originally about 250 square kilometres, broke off a Greenland’s Petermann Glacier last Aug. 5 and moved into Canadian waters this spring. Massive Greenland iceberg drifts towards N.L.